In March at the Open Compute Project (OCP) annual summit, we announced that Project Olympus, our next generation hyperscale cloud hardware design, attracted the latest in silicon innovation to address the exploding growth of cloud services. Project Olympus was based on a new hardware development model for community based open collaboration that we developed with OCP. Today, Microsoft is proud to announce support for the newest generation of Intel Xeon Scalable Processors within the Project Olympus ecosystem. Intel has been a premier platform partner for Project Olympus and the Intel Xeon Scalable Processor will be a cornerstone for this new platform. Microsoft has also worked closely with Intel to engineer Arria-10 FPGAs, which are deployed on every single Project Olympus server, to create a “Configurable Cloud” that can be flexibly provisioned and optimized to support a diverse set of applications and functions. We designed Project Olympus with the ability to accommodate a variety of workloads from email to databases, online productivity, HPC, and even AI. Some of these workloads have extremely demanding requirements for compute, storage, and networking which require a base platform that can scale with demands of current and emerging workloads. Intel Xeon Scalable Processors enable such platform capabilities by providing the ability to scale resources as needed. 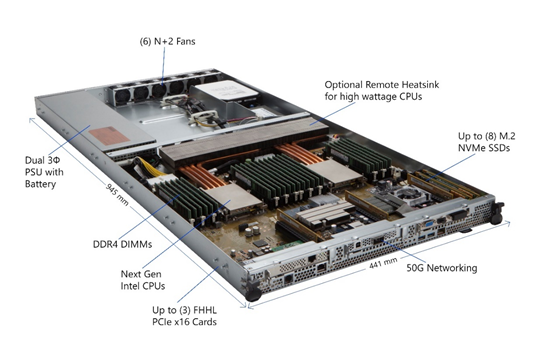 Whether it’s high core counts and memory bandwidth for extreme multithreaded performance, IO scaling capabilities, or the new Intel AVX-512 instructions for HPC and AI workloads, Intel Xeon Scalable Processors, and Intel FPGAs provide a significant degree of flexibility and performance that allows us to meet the emerging demands of the cloud. Project Olympus is Microsoft’s blueprint for future hardware development and collaboration. We look forward to the continued collaboration with Intel in designing and building the highest performing, most flexible, and secure clouds possible.